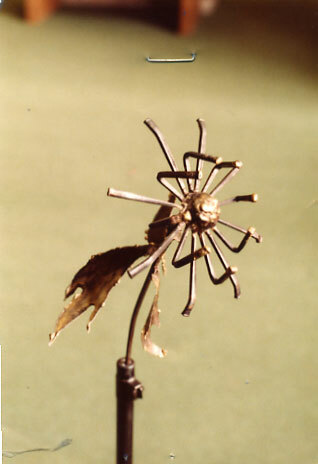 From the collection of Dr. J. Gregory Payne. 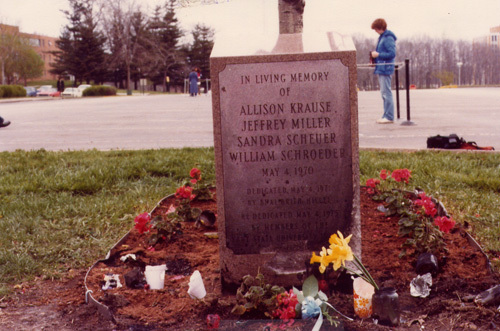 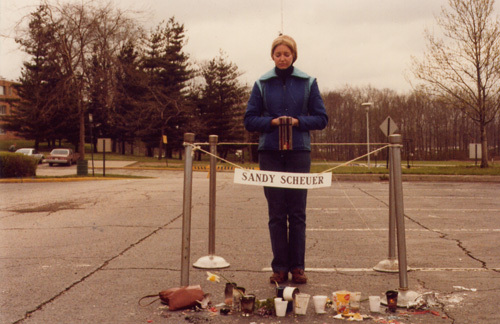 Martin and Sarah Scheuer, parents of Sandy Scheuer at Kent State memorial forum, Kent State University, May, 1982. 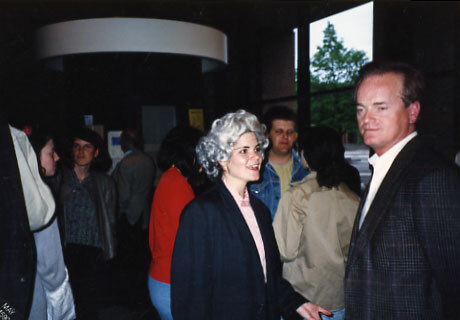 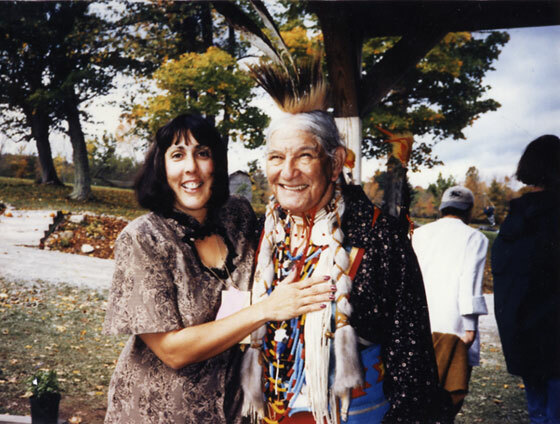 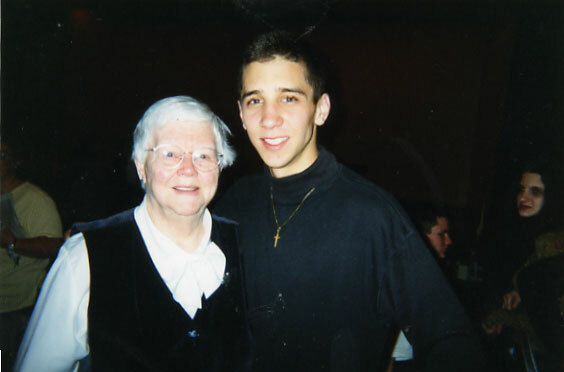 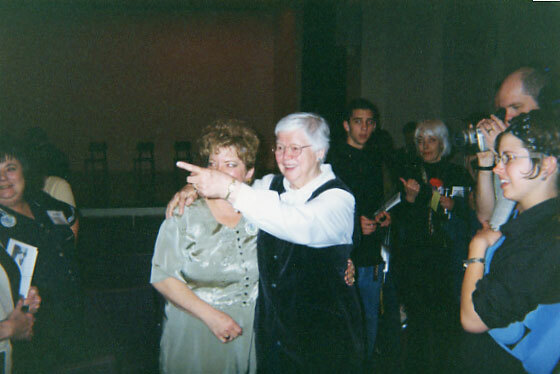 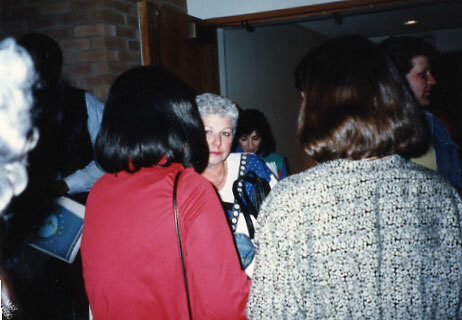 Kendra Hicks (Allison, right) of North Carolina State production with Jill Polgar (Florence Schroeder), Kent State performance,1995. 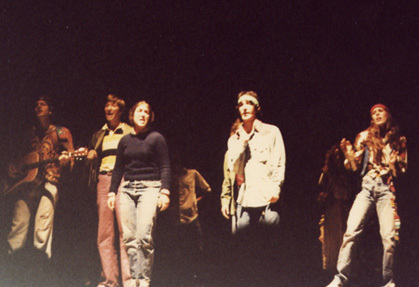 Scene from Kent State: A Requiem, Occidental College cast, l981, Occidental College, Los Angeles, California. 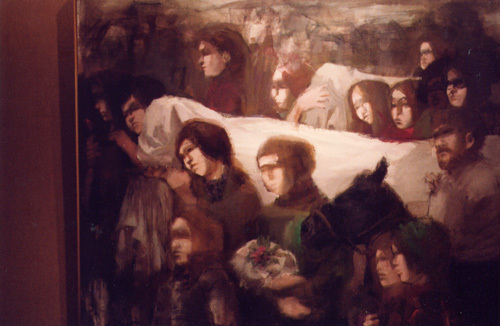 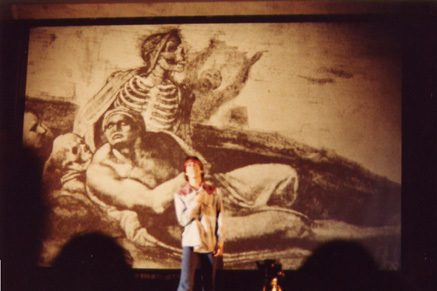 Scene from Kent State: A Requiem, performed at University of Illinois, Spring, 1981. 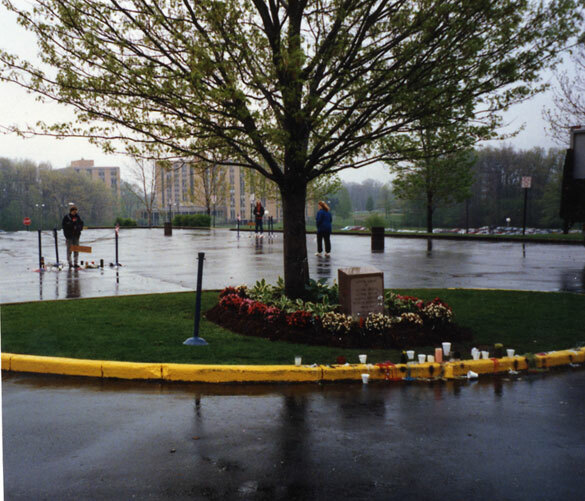 Kent State: A Requiem performance Part II. 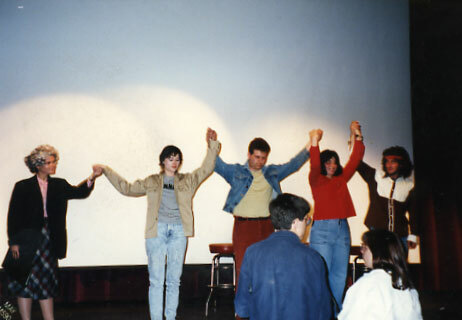 Jeff Selleck, Neil Tadkin, Corrie Patterson, Tom Flynn, Laura Moore. 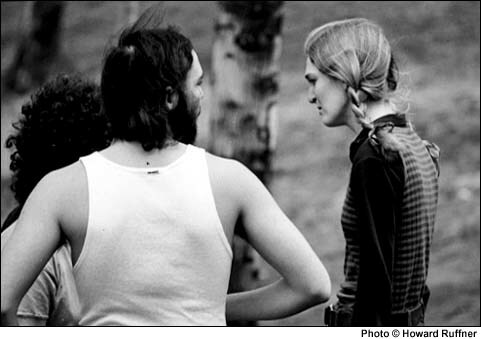 Photo by Thomas David. 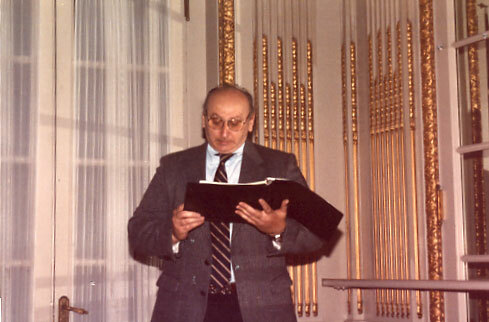 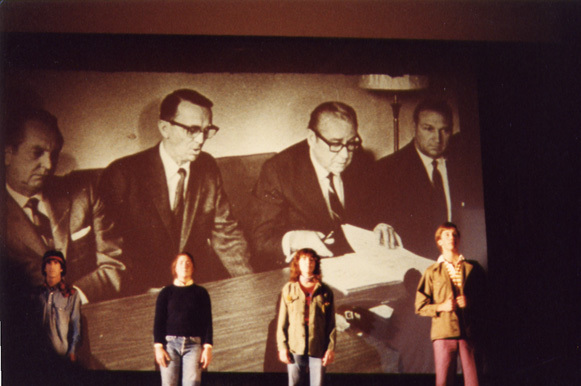 In l982, the Requiem performances included rock opera lyrics and music by Peter Marston, who played Bill Schroeder in the original readers' theatre version. 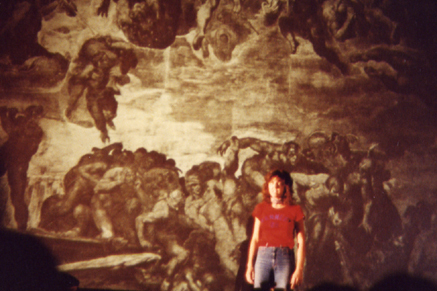 this picture is of the performance at Occidential College, Spring, 1981. 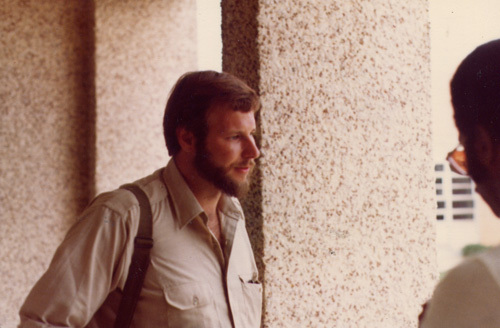 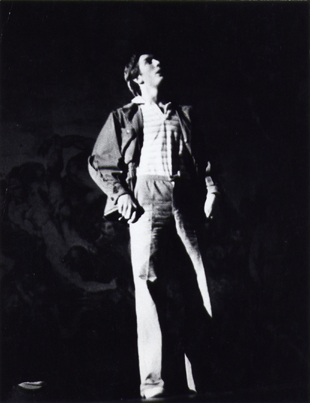 Tom Flynn as Jeffrey Miller, Act 1, Purgatory, Kent State A Requiem, 1981, Occidental College cast. 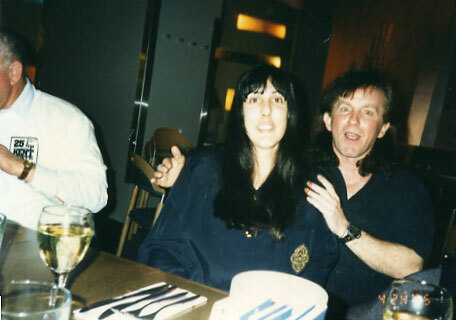 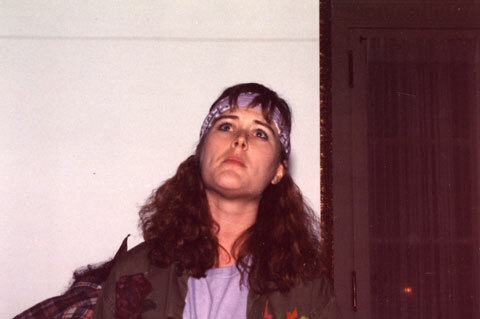 Terry Troy as Allison Krause, (ibid). 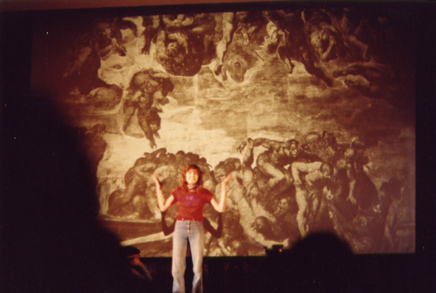 Terry Troy as Allison, Purgatory, Act one, (ibid). 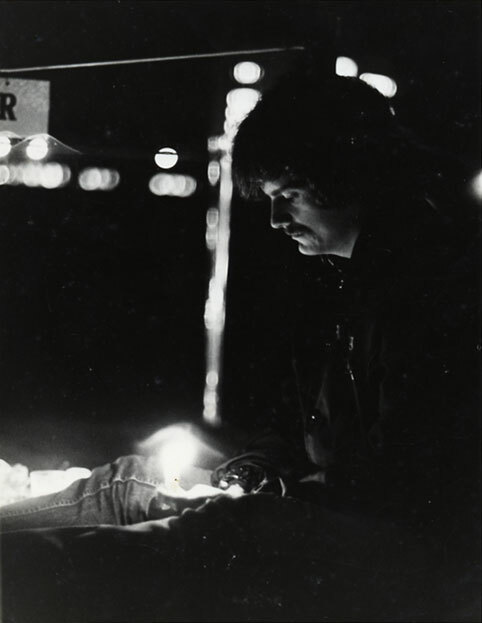 Tom Flynn as Jeff Miller, May 1, 1970, Act 1 , (ibid). 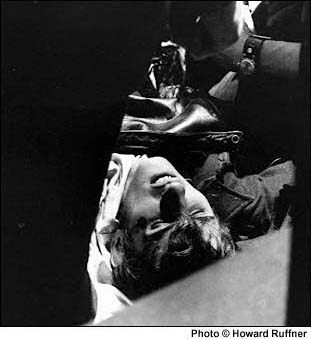 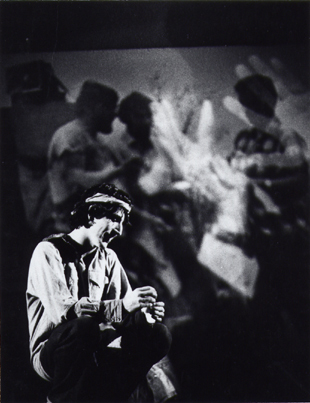 Neil Tadkin, (Bill Schroeder), Act 3, Last conversation with his mother, Kent State: A Requiem, Kent State University performance, May, 1981. 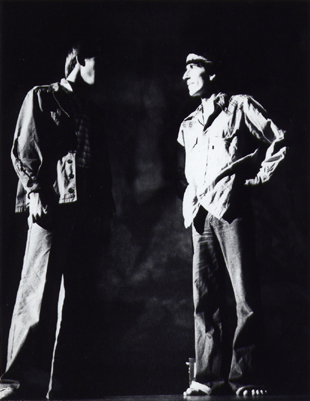 Neil Tadkin (Bill Schroeder) and Tom Flynn (Jeffrey Miller) in purgatory, Act 1, Kent State: A Requiem, Rend Lake College, Mt. 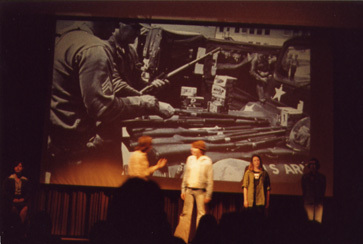 Vernon, Illinois performance, Spring, 1981. 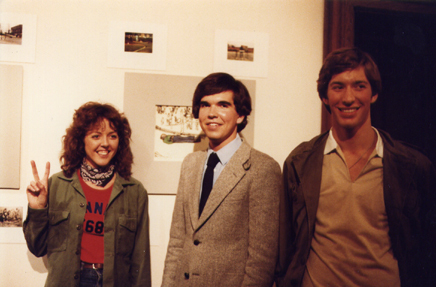 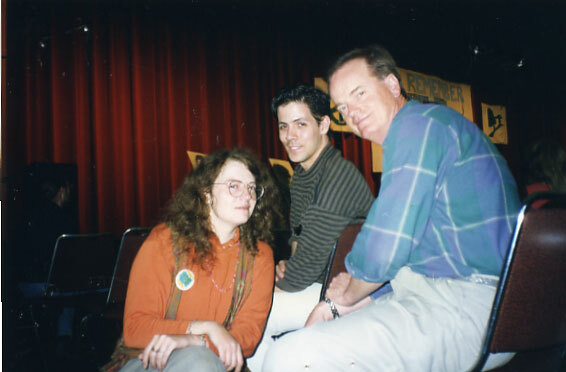 Terry Troy (Allison), John David (Narrator) and Neil Tadkin ( Bill Schroeder) at the Kent State art exhibit of Lynda Lyke paper hangings, Occidental College, Spring, 1981. 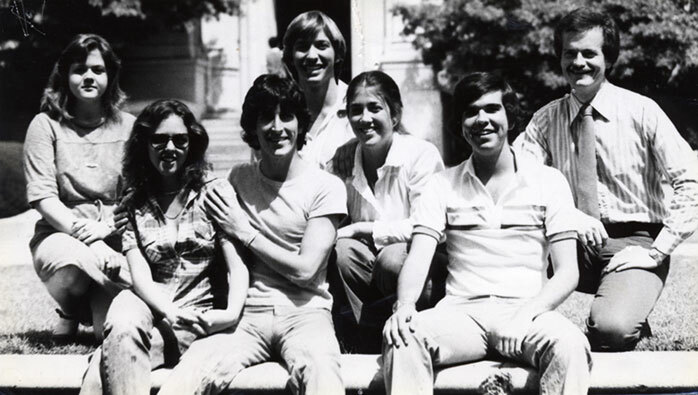 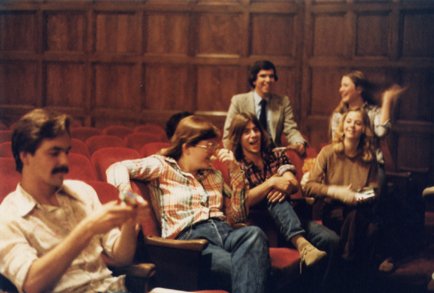 Kent State: A Requiem cast, Occidental College premiere, Spring, 1981. 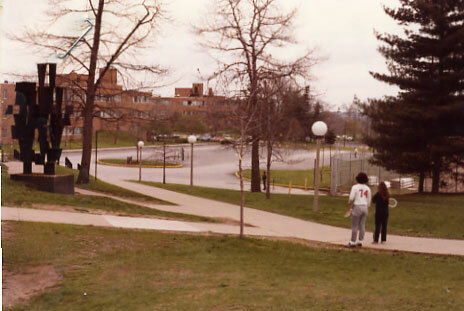 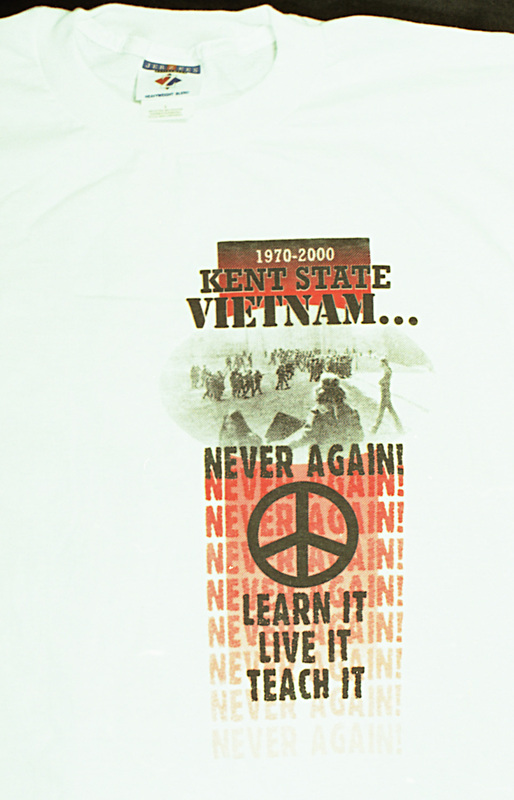 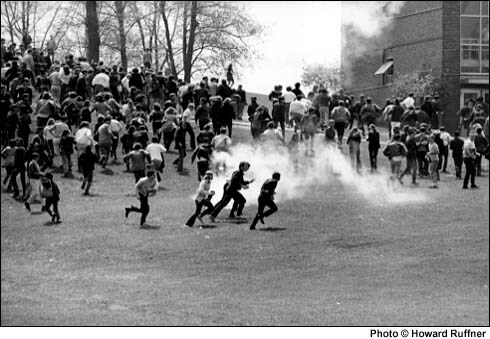 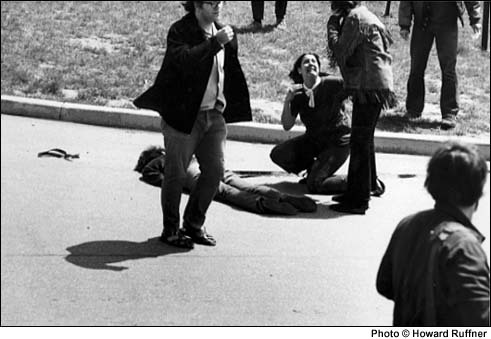 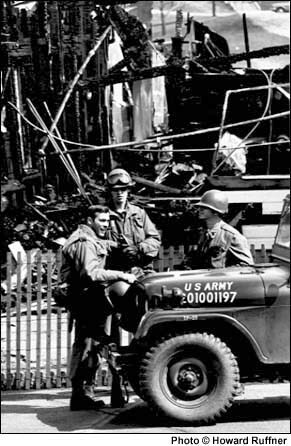 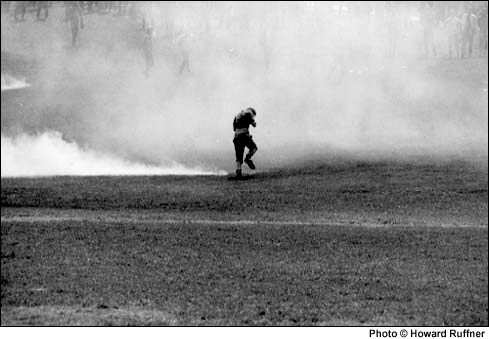 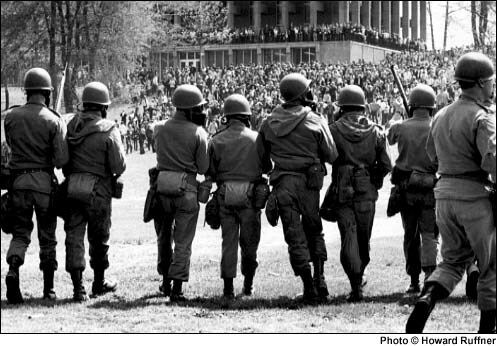 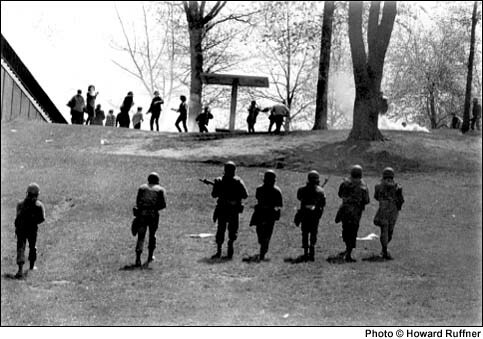 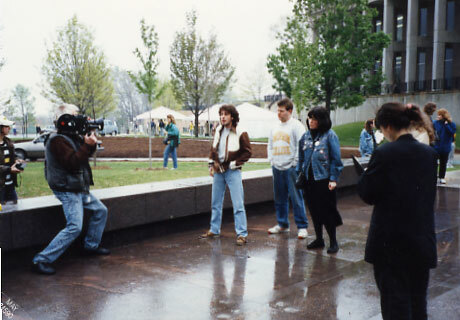 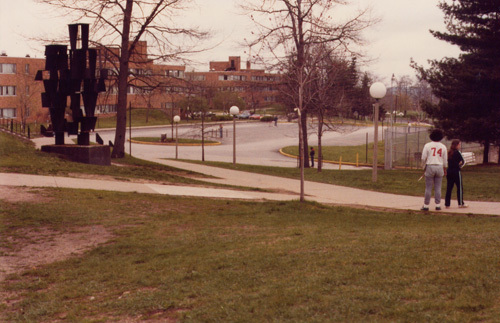 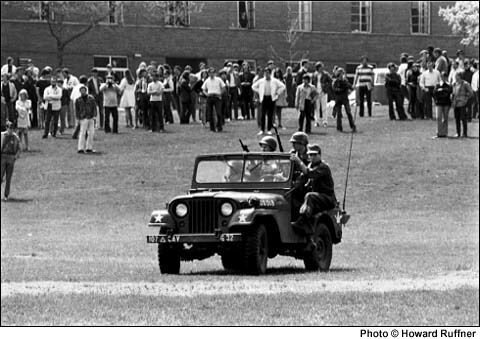 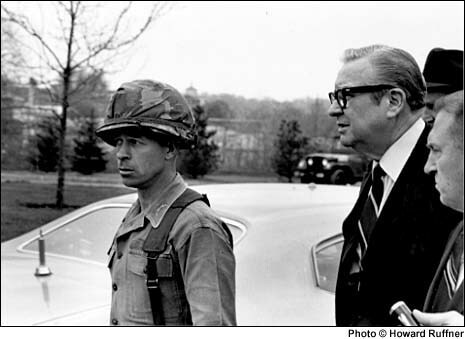 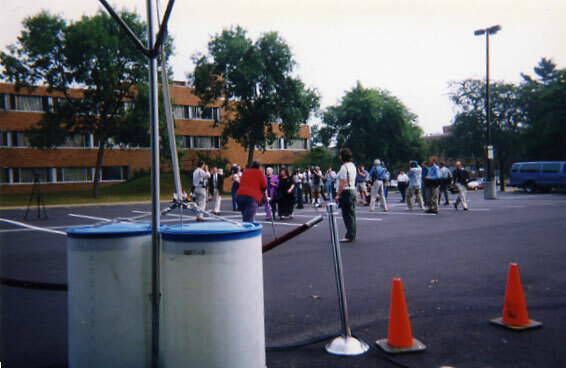 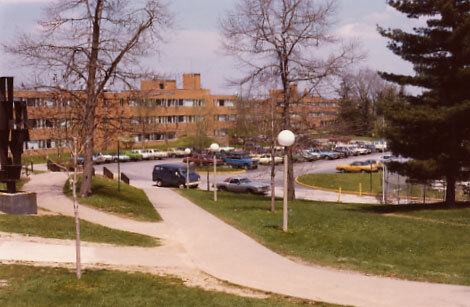 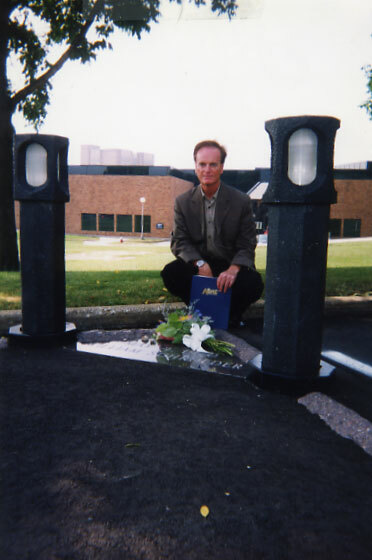 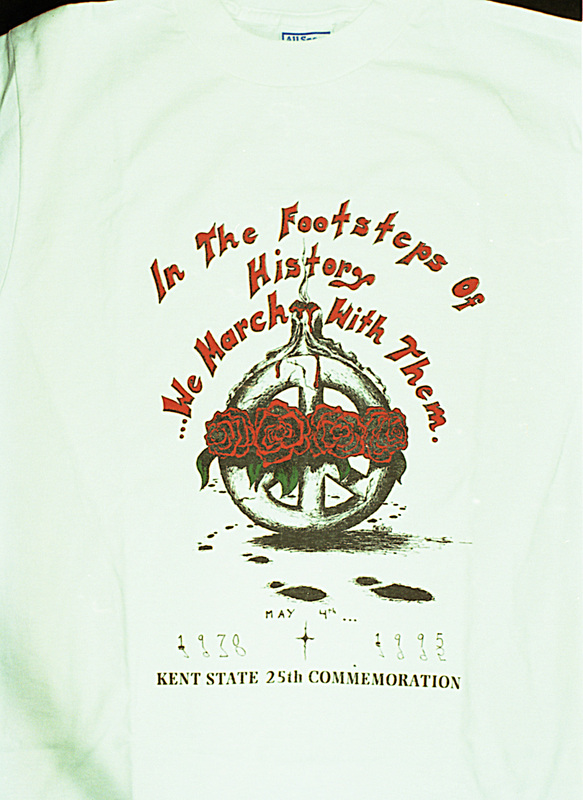 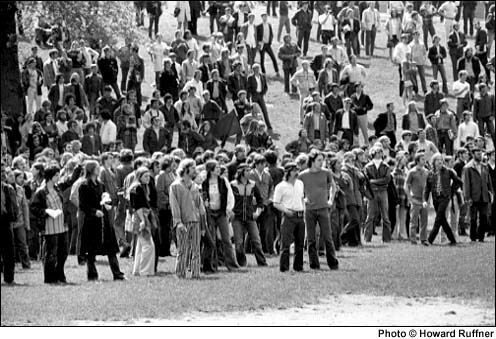 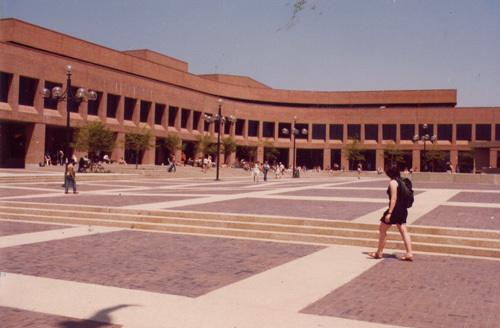 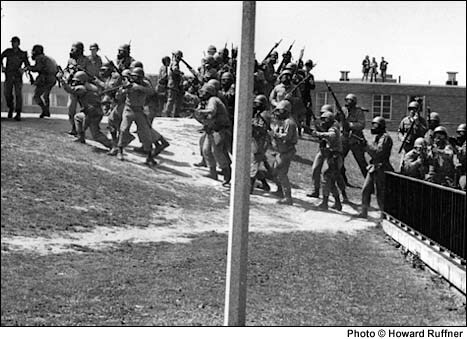 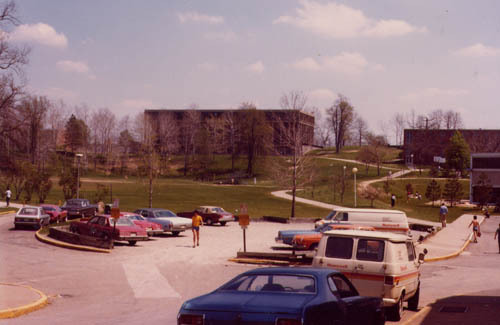 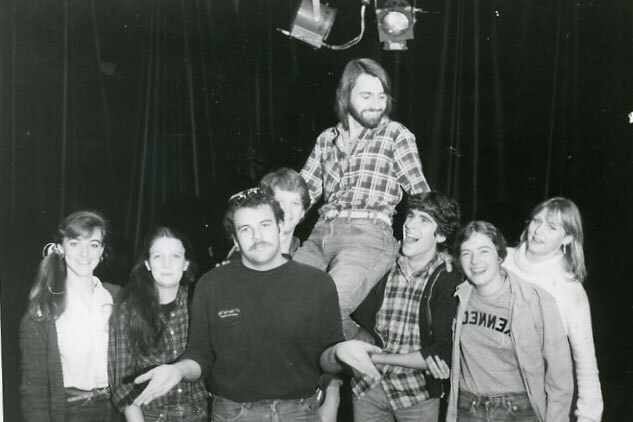 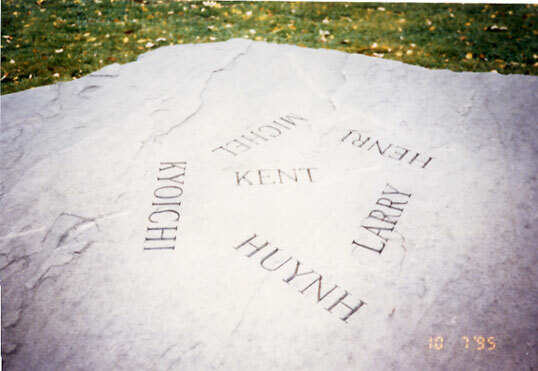 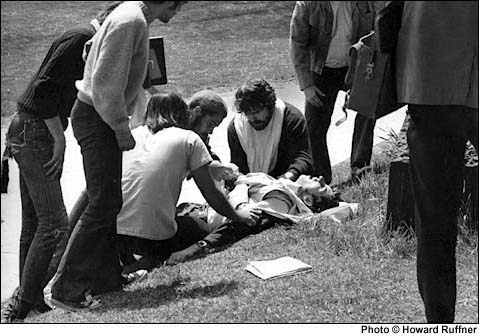 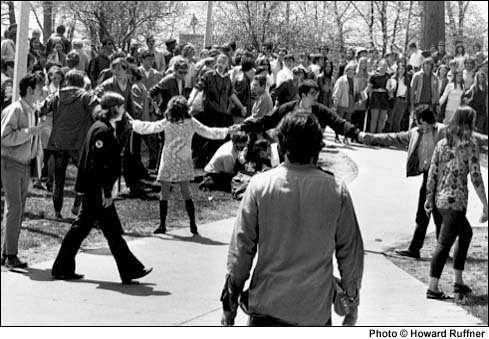 Kent State, NBC's Award winning docudrama, "Kent State" aired in l981. 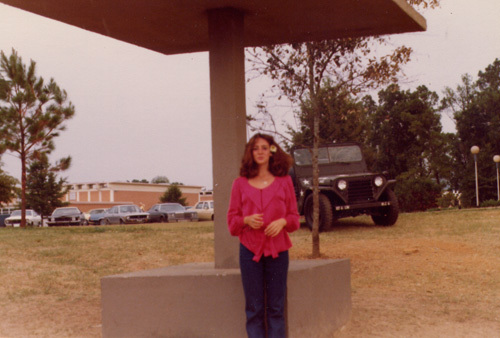 On location, filming of Sandy Scheuer's parking lot scene, NBC's emmy award winning "Kent State," Gadsden, Alabama, Summer, 1981. 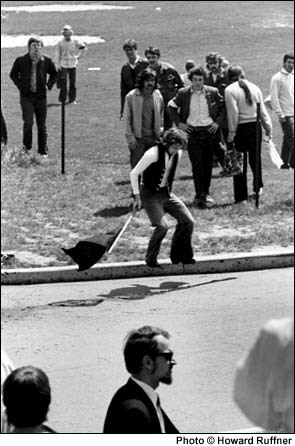 View of motorcycle gang on "Blanket Hill" NBC's filming of "Kent State," Gadsden, Alabama, Summer, l981. 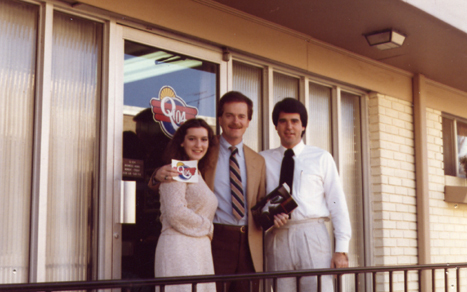 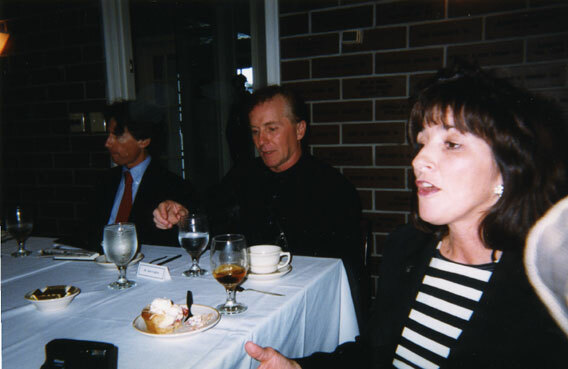 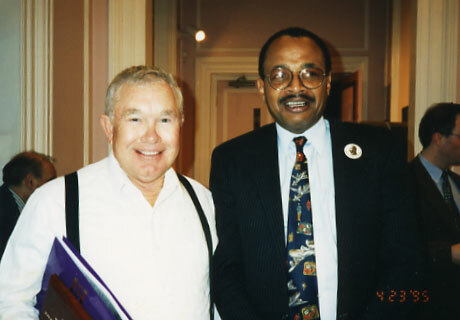 Gregory Payne, historical consultant, with Gadsden radio interviewers, Gadsden, Alabama, as part of NBC promotional tour for docudrama, Kent State. 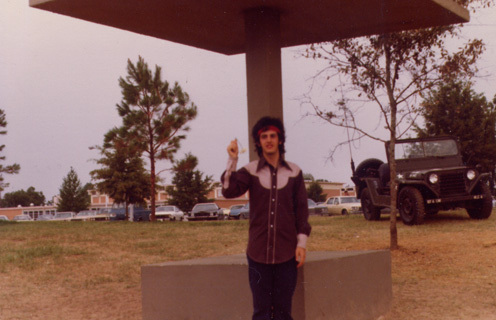 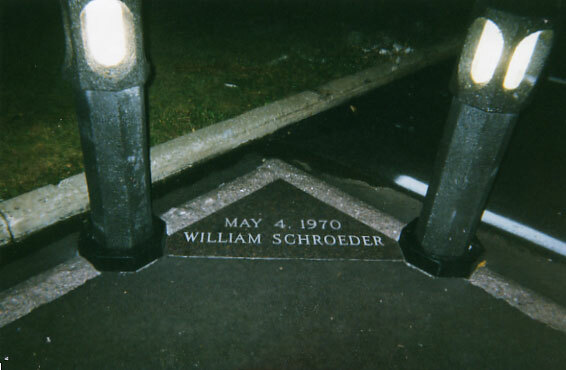 Keith Gordon (Jeffrey Miller) depicted in clothing similar to what Jeff wore on May 4, 1970. 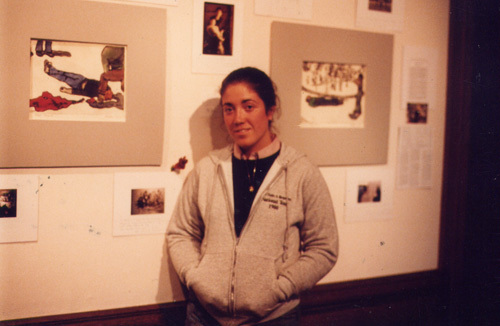 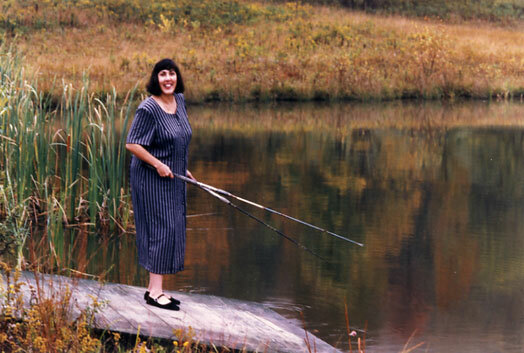 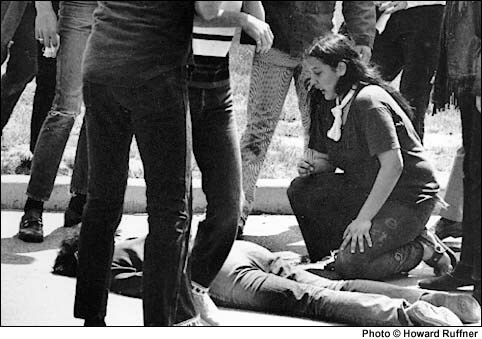 Talia Balsam (Sandy Scheuer) depicted in clothing similar to what Sandy wore on May 4, 1970. 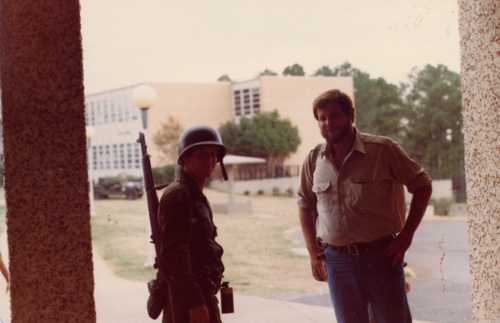 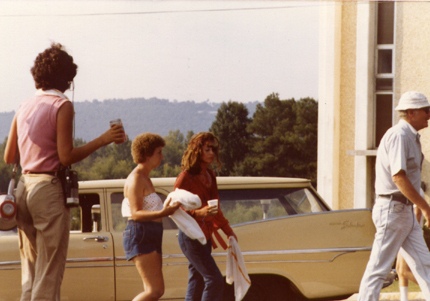 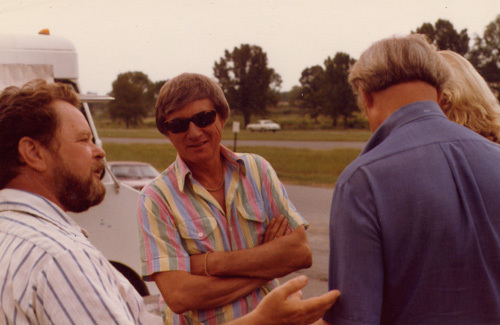 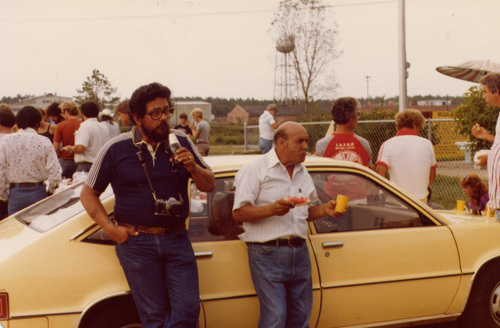 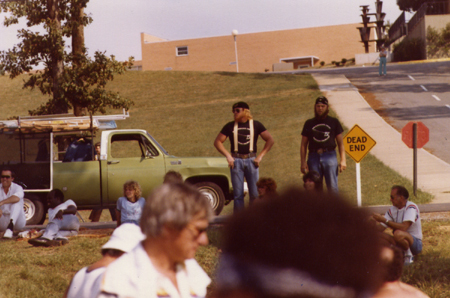 Film crew at Gadsden State, Summer 1980. 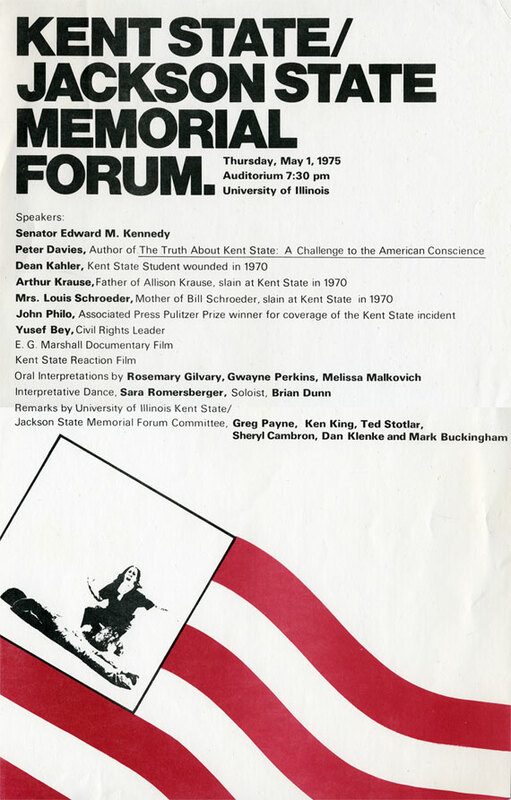 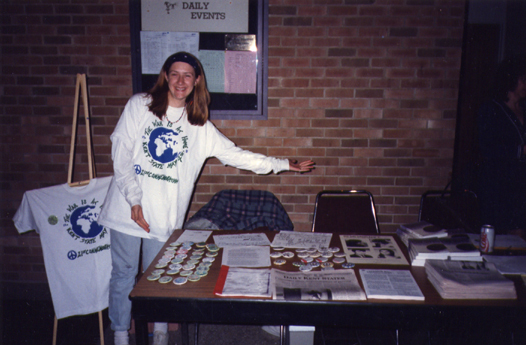 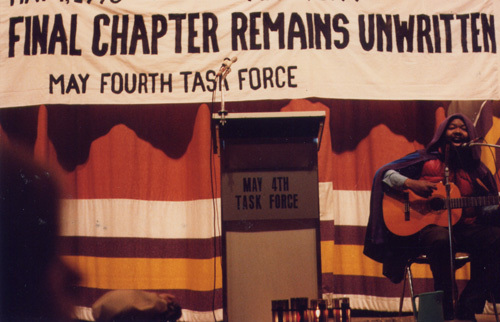 Kendra Hicks at Kent State Memorial Forum, 1983. 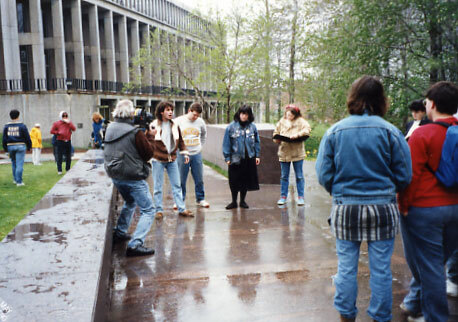 Photo by Kendra Hicks. 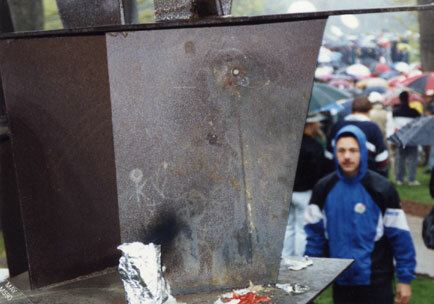 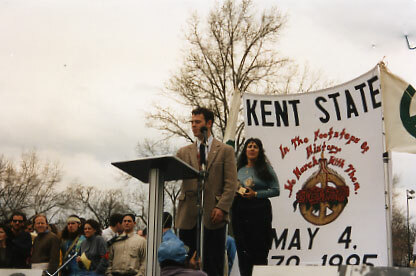 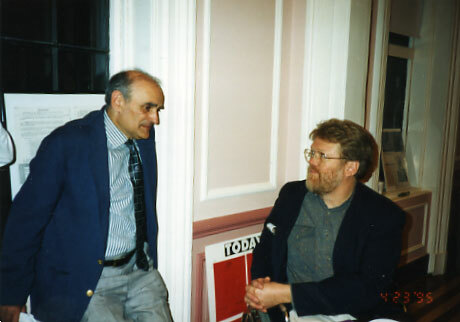 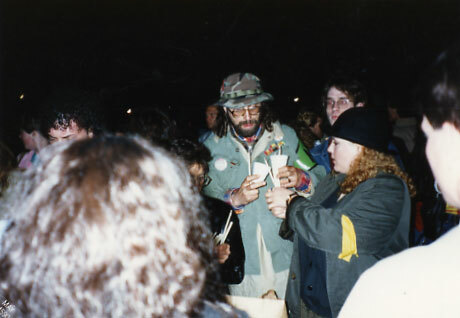 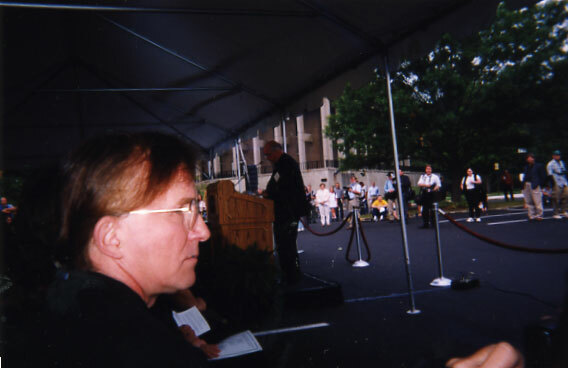 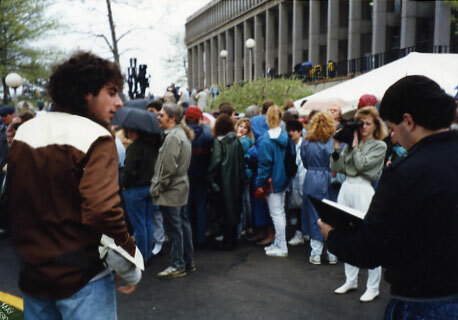 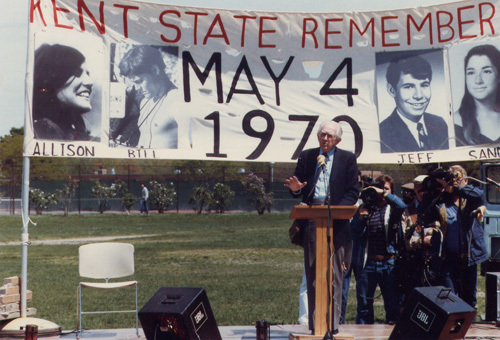 Ohio Senator Howard Metzenbaum at Kent State, 1990. 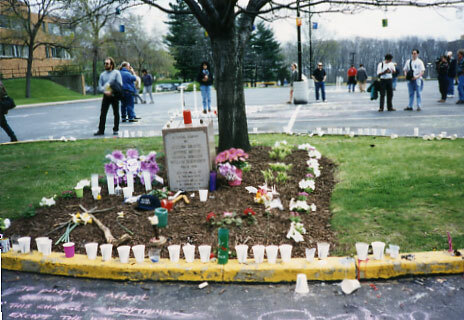 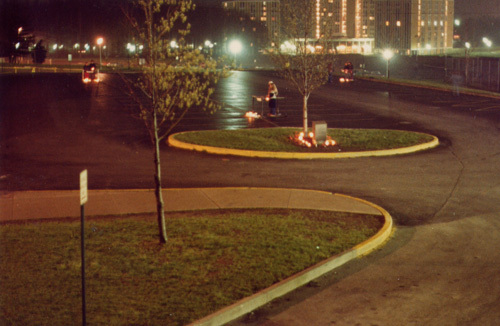 Parking lot, candle light vigil, 2 a.m. May 3, 1888. 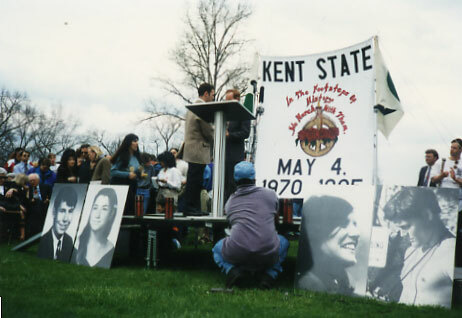 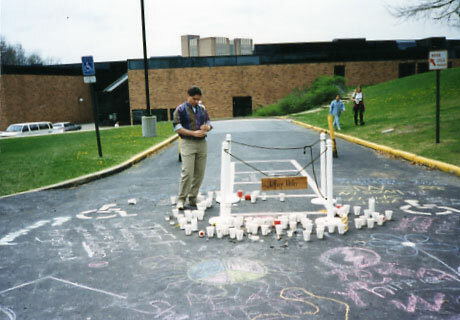 Artistic rendition of the vigil on May 3 at Kent State University. 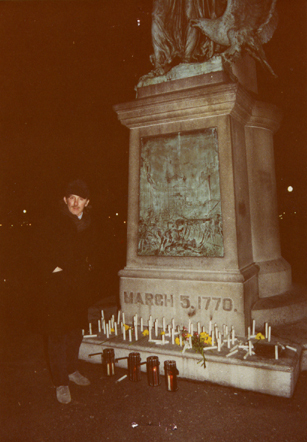 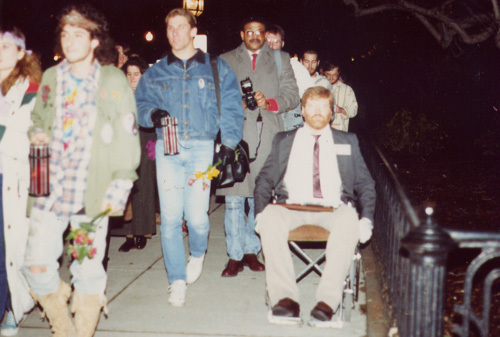 Alan Canfora, wounded at Kent State, May 1970, at the Boston Massacre Memorial, Boston, MA for the Candlelight Vigil following the 25th Anniversary Forum, Kent State - Jackson State Retrospective, Sponsored by the Center for Ethics in Political and Health Communication though a generous donation by Helen C. Rose and Shawn Donnelley. 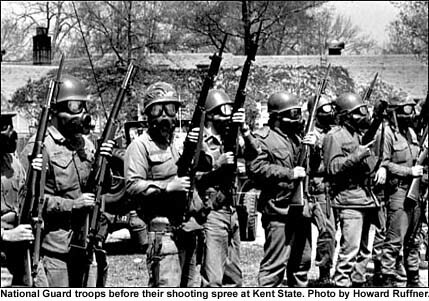 The official May 4 Task Force stance. 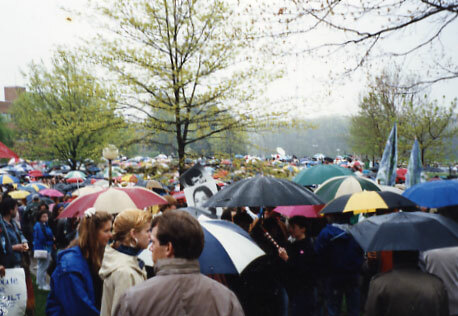 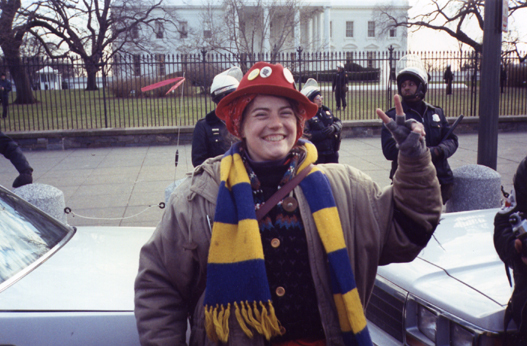 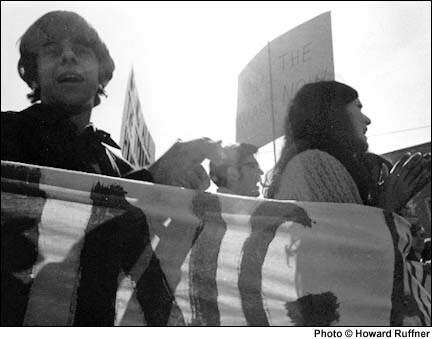 Anti-war demonstration, Washington DC Jan. 1991. 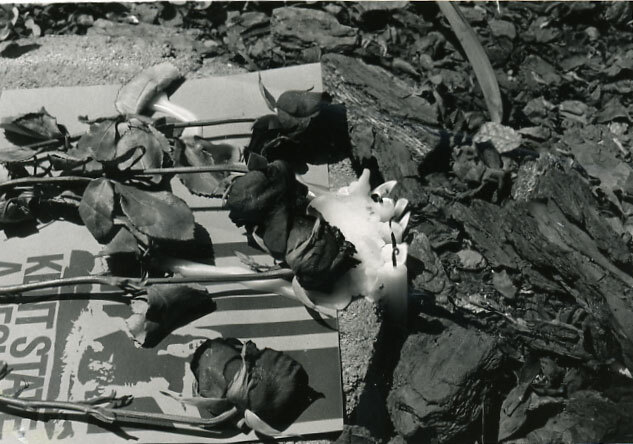 Photo by Kendra Lee Hicks. 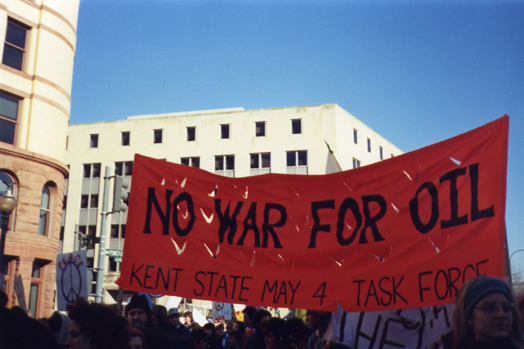 Kendra Hicks, Kent State activist, Washington March, l991, Photo by Michael Pacifico. 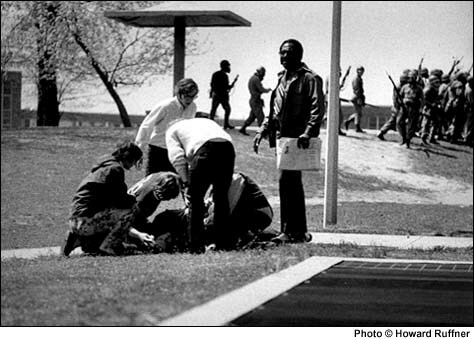 Kendra Hicks and Gene Young, wounded at Jackson State in May 1970. 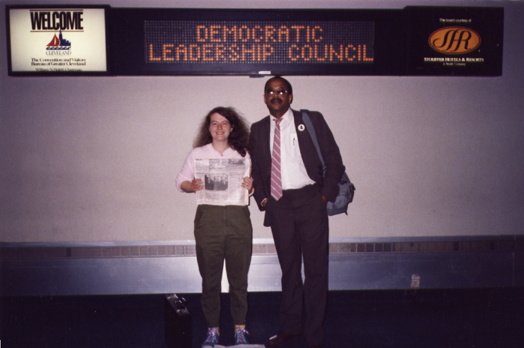 At Cleveland Leadership Council, spring, 1982, Photo by Michael Pacifico. 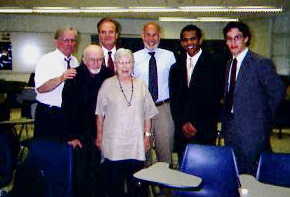 Jeff Miller's mother and stepfather, with Alan Canfora and Greg Payne at Jeff's high school in Plainview New York. 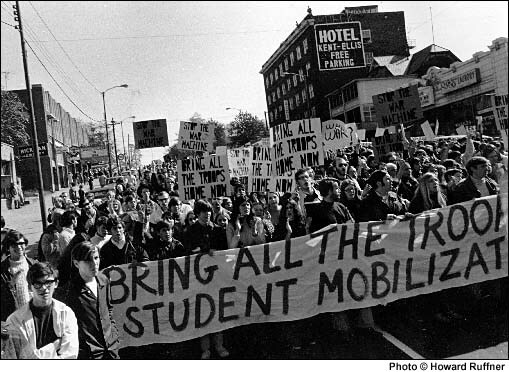 The student govt. 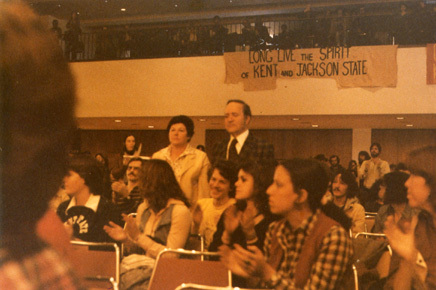 association dedicated a room in honor of Jeff last year. 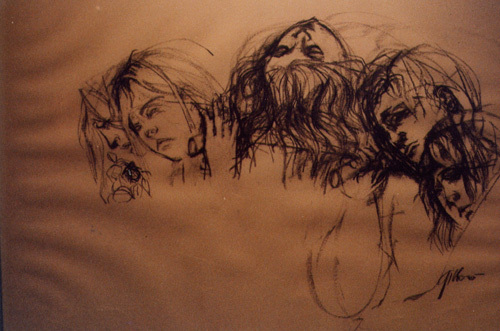 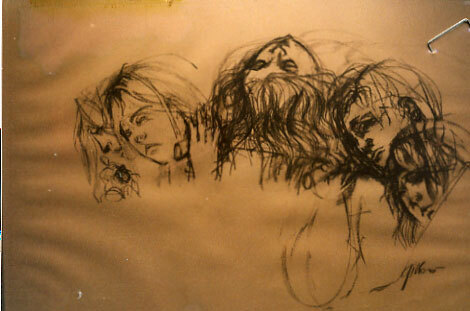 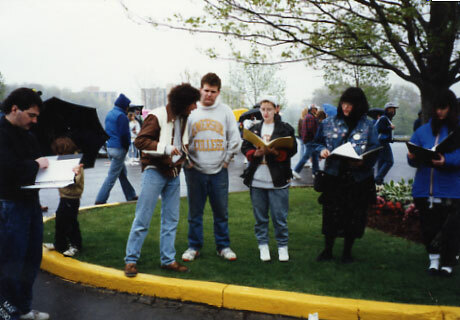 Pencil renderings of students taking part in vigil at KSU, 1985. 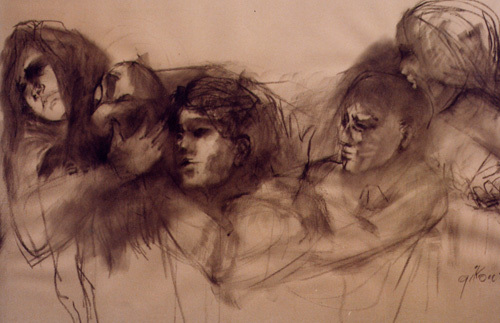 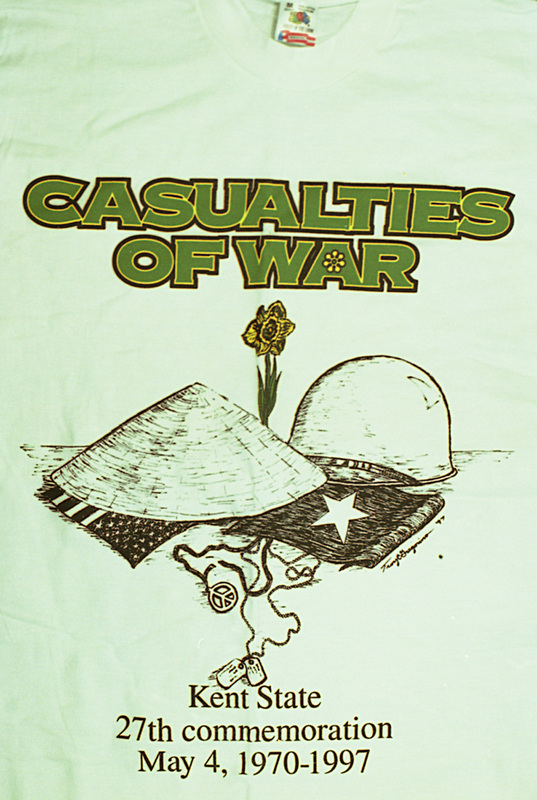 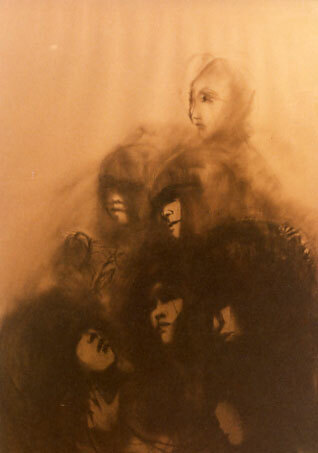 Grief expressed in pencil drawing, KSU, May 4, 1985. 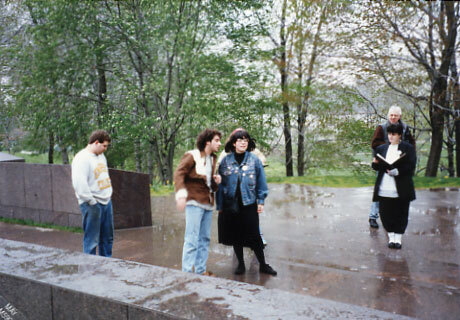 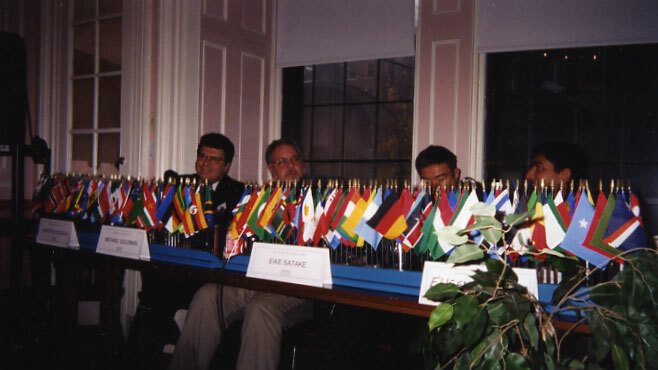 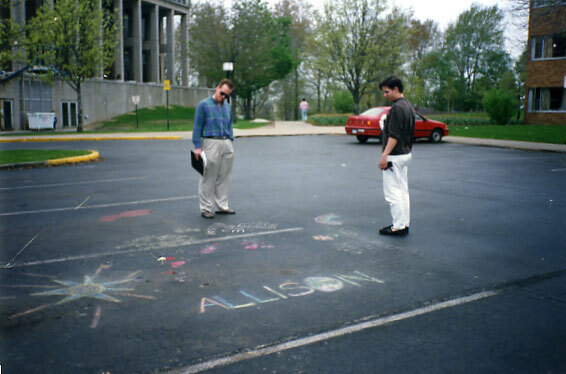 Russian professors and visitors at Kent State, 1990. 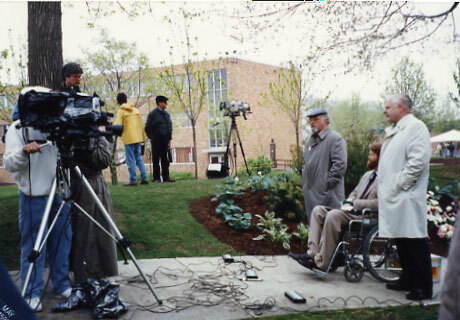 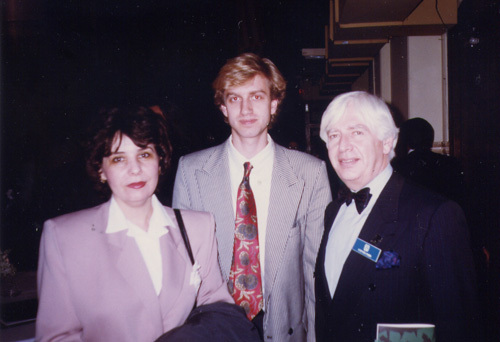 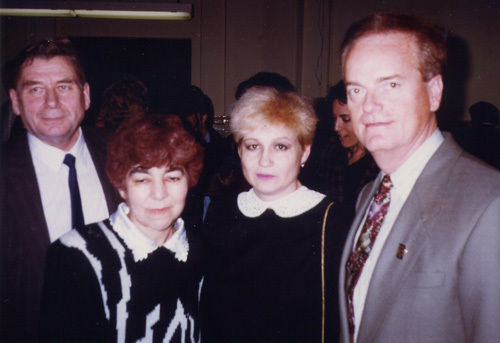 Parents of Russians students killed by military in Moscow with Dr. Payne, 1990.